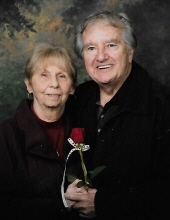 JACQUES, Carol Anne - Age 80, of Fenton, died peacefully at her home, Wednesday, January 16, 2019. Services will be held 1:00 PM Thursday, January 24, 2019 at Sharp Funeral Homes, Fenton Chapel, 1000 Silver Lake Road, Fenton. Fr. David Harvey officiating. Visitation will be held at the funeral home Thursday from 11 AM until the time of the service. Those desiring may make contributions to Adopt-A-Pet. Carol was born April 9, 1938 in St. Cloud, MN, the daughter of Reginald and Vera (Lego) Carolyon. She was raised by her grandmother in the Upper Peninsula, Negaunee. She attended St. Paul Catholic Church and School, where she was a cheerleader and played the organ for daily Mass. Carol married Kenneth James Jacques September 7, 1957 in Negaunee. She had resided in the Fenton/Holly area since 1962. She was a licensed cosmetologist. She was a member of St. John the Evangelist Catholic Church. Surviving are: her husband of 61 years, Kenneth; daughters, Michele (Rick) Crandell of Flint, Bridgette Jacques of Linden, and April Schupbach of Fenton; grandchildren, Jessica (Ryan) Burbo of Florida, Alexann (Nick) Worstell of Colorado, Art (Aubrey) Schupbach of Ann Arbor, Conrad Pieczynski of Fenton, Zachary Schupbach of Fenton, and Kelsey Wright of California; great grandchildren, Summer, Lilly, Logan, and Lydia. She was preceded in death by her parents. Tributes may be posted at www.sharpfuneralhomes.com. To send flowers or a remembrance gift to the family of Carol Anne Jacques, please visit our Tribute Store. "Email Address" would like to share the life celebration of Carol Anne Jacques. Click on the "link" to go to share a favorite memory or leave a condolence message for the family.